Scooper - Technology News: How will 5G internet change the world? At the recent Mobile World Congress, 5G was all the rage . The Economist described the next generation of mobile networks as something that will “ offer users no less than the perception of infinite capacity .” The rollout of 5G is expected to enable and widely disseminate technologies, such as: the Internet of Things, self-driving cars, autonomous drones, and Star Wars-inspired hologram phones. What was considered science-fiction just a decade ago is currently being prototyped, tested, and piloted. A $1 billion investment in a New Mexico “ghost town” speaks for itself. And, as we enter the era of 5G, the formerly futuristic gadgets might just become commonplace. But what are the broader policy implications of ever-improving connectivity? What impact does mobile have on society? How can we find a balance between accelerating technological progress and governments’ responsibility to improve the economic conditions and raise the level of wellbeing for their citizens? Competitiveness offer a useful framework for considering such questions. As the IMF warns about economic slowdown, markets grow more volatile, and pundits become increasingly pessimistic about growth prospects, enlightened policy-makers across the world have made the pursuit of competitiveness, rather than GDP, their principal economic goal. Competitiveness is about the fundamentals and the positioning for a successful future, unlike GDP, which is susceptible to Kondratiev Waves and is often dependent on natural endowments, commodities super-cycles, monetary policies in some of the world’s biggest economies, and other external factors. What then is the best way to improve competitiveness? As with all the other complex problems, there isn’t a single solution. Different strategies apply to countries at different stages of development. Nevertheless, one policy area has a nearly universal applicability. This ‘silver bullet’ of economic development is broadband connectivity . All three pillars of competitiveness as defined by the World Economic Forum , incorporate the connectivity component, be it telecoms infrastructure under the basic sub-index, technological readiness under efficiency enhancers, or the entire pillar of innovation and business sophistication where a high degree of connectivity is a basic precondition. The World Bank calculates that with “a 10% increase in high speed Internet connections, economic growth increases by 1.3%” and leads to “democratization of innovation.” In a world where only 40% of the population have access to the internet; we could boost the global GDP by $1 trillion by connecting another 327 million people. More importantly, this will contribute to sustainable and inclusive growth, supporting economic development in the emerging markets where internet penetration is lagging. While a consensus is yet to be reached over the scope and scale of the effect we should expect from mobile connectivity on poverty-reduction, some argue that it might be the best hope we have. 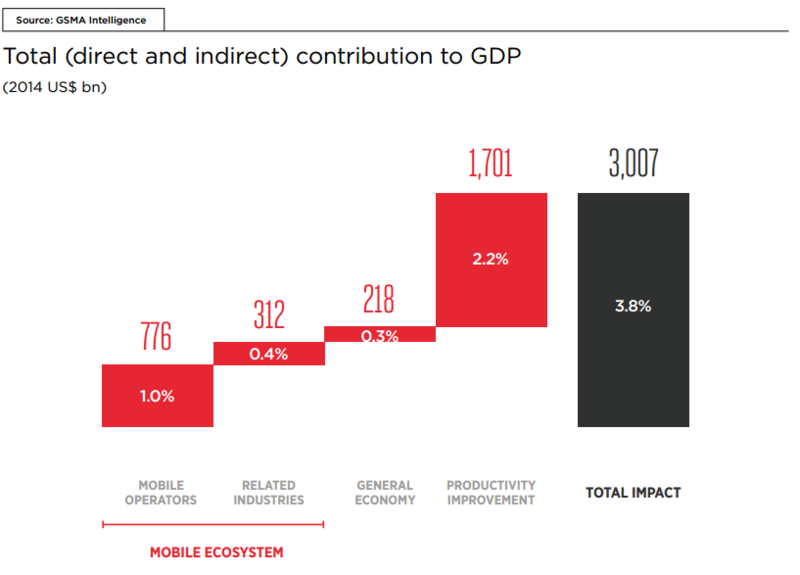 GSMA postulates that “Mobile internet access can create a virtuous cycle in developing countries” and has calculated that a better part of a mobile ecosystem’s impact on the global economy comes from productivity gains elsewhere. 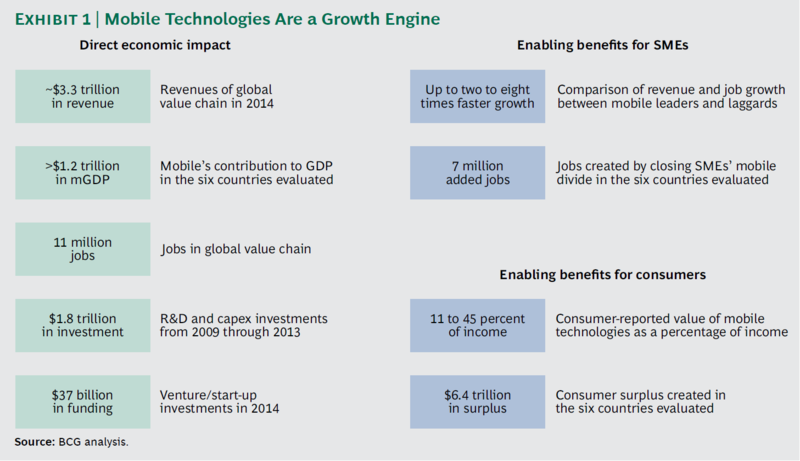 When researching the impact of mobile technologies across six countries (U.S., Germany, South Korea, Brazil, China and India), BCG termed this sector a growth engine and looked at the impact it has on SMEs, jobs, as well as benefits to consumers. In this day and age, connecting is empowering , and without basic infrastructure financed by telecom operators, today’s tech giants from Apple and Google to Uber and Facebook would not have achieved half the success that they enjoy. As we move into the era of digital inclusion , we should expect innovation to come from the currently unconnected and the new never-thought-of-before services emerging to address the needs at the base of the pyramid in a commercially-viable manner. In its own research , the World Economic Forum found “widespread agreement - along with emerging evidence – that access to technology can help improve quality of life and accelerate development efforts at all levels.” Improvements in mobile broadband will help create conditions where mHealth , m-learning , MFS (mobile financial services), etc. could thrive. The pace of mobile-services adoption will accelerate further yet, as the notion of digital-identity takes hold. Just a year ago, all eyes were on Estonia as it pioneered e-residency for foreigners, but now the idea of national/universal digital identification is gaining world-wide attention. Given such wide societal implications, the sector, formerly classified as a utility, is now striking on its own – personifying its new identity as an industry of empowerment . As the world is trying to master the Fourth Industrial Revolution , the Forum is asking the right questions : “will developing countries leapfrog ahead – or be left behind?” What is certain, however, is that mobile connectivity will be at the forefront of change and will remain a silver bullet of social inclusion and economic competitiveness. Have you read? Are you ready for 5G internet? Is this the future of the internet of things? What is the Fourth Industrial Revolution?